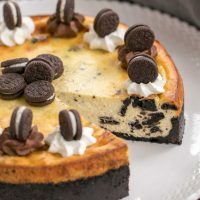 This creamy, rich Oreo Cheesecake with Oreo Cookie Crust is an ideal dessert for the Oreo lovers in your life! In a food processor, process 26 cookies to form fine crumbs. Mix crushed cookies with butter; press onto bottom and 2 inches up side of 9-inch springform pan. Wrap sides of pan with foil. In a stand mixer fit with the paddle attachment (or use hand mixer), beat cream cheese and sugar to blend. Add sour cream and vanilla. Add eggs, 1 at a time, mixing on low speed after each just until blended. Stir in chopped Oreos. Pour into crust. Place cheesecake in a roasting pan or other large pan and carefully pour hot water into the pan until it reaches an inch or two up the side of the pan. Bake 1 hour or until center is almost set. Run a knife around rim of pan to loosen cake. Cool on rack and then chill overnight. Recipe adapted from Philadelphia Cream Cheese.